Mayawati made it clear that in her political attacks against the ruling BJP, off-and-on ally Congress would not be spared. Mayawati said the Congress had a lot to learn in the three states it won recently. Mayawati, on her 63rd birthday, said her biggest gift would be for workers of her Bahujan Samaj Party (BSP) and the Samajwadi Party to put their past bitterness behind and ensure victory in Uttar Pradesh in the national election, as India's largest state will also decide who will be the next prime minister. "This time my birthday is being celebrated at a time when the national election is ahead. In the biggest state, we have announced an alliance with the Samajwadi Party that has robbed the BJP and others of their sleep," said Mayawati. "UP decides who will come to power in the centre and who will be prime minister. The BSP and SP must fight together, setting aside their differences and ensure the victory of all gathbandhan (alliance) candidates. It will be the biggest gift for me," said the former chief minister in her traditional birthday press conference. 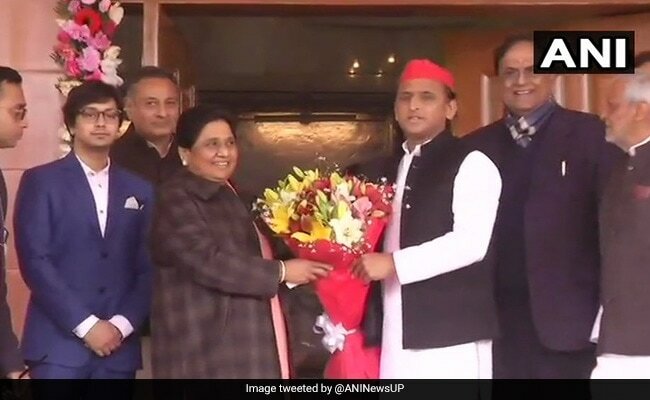 On Saturday, when Mayawati and Samajwadi Party chief Akhilesh Yadav announced their alliance, a question on the BSP chief as prime ministerial candidate came up. "UP has given India many prime ministers. You know who I would support. I will be happy if again there is a prime minister from UP," Akhilesh Yadav had said, as Mayawati looked on, smiling. Mayawati also made it clear that in her political attacks against the ruling BJP, off-and-on ally Congress would not be spared. After leaving the Congress out of the UP alliance, the BSP chief today again took aim at Rahul Gandhi's party, saying it had a lot to learn in the three states it won last month. "Already, fingers are being pointed at the Congress," she said, launching a detailed critique of the farm loan waivers announced by the new Congress governments in Madhya Pradesh, Rajasthan and Chhattisgarh. "The big question is why the farm loan waiver cut offs have been set to nine months ago. Also these governments are only waiving loans up to Rs 2 lakh and this will not help farmers in any manner," Mayawati said. The BSP, she said pointedly, had never been a slave of industrialists, "unlike others who ultimately end up only writing off the loans of big industrialists". She also referred to the Rafale deal controversy - on which Rahul Gandhi has incessantly attacked Prime Minister Narendra Modi -- and placed the Congress in the same boat as the BJP. "There should be a proper mechanism for defence purchases to avoid fiascos like Bofors and Rafale," she said. Attacking the BJP, she said agencies like the Central Bureau of Investigation were being misused. "A prime example in front of you is SP chief Akhilesh Yadav," she said.